Pekka Kuusisto follows the score explicitly, sporting a tone with a pleasing edge, singing but without resorting to sentimental tricks. Leif Segerstam and the Helsinki Philharmonic perform splendidly, with real understanding and understatement. Although the tempos are slowish, the breadth is backed by a sure rhythmic foundation, breathing authentic Finnish air. This CD release forms the final part of Ondine's Sibelius 2007 campaign, paying homage to the foremost icon of Finnish classical music, who died 50 years ago. 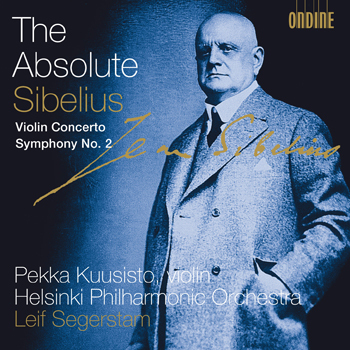 The Helsinki Philharmonic Orchestra, which played Sibelius's music under the composer's baton, and chief conductor Leif Segerstam have unrivaled credentialsin the performance of Sibelius's music. Starring in the Violin Concerto is young violinist Pekka Kuusisto ("may be the best thing to happen to classical music" - The Guardian, 16 January 2007), who recorded the famous work shortly after winning the Sibelius competition in 1995. His acclaimed first disc on Ondine won The Music Industries Association's 'Annual Award for Excellence' in 1996 and was an international bestseller (ODE 878-2). The 45-minute Second Symphony is the most popular of Sibelius's symphonies. The present recording was released for the first time in 2003 (ODE 1026-2).